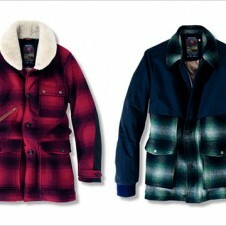 Unisex silhouettes and luxury fabrics dominate English fashion line 1250's autumn/winter 2011 collection. Before starting her own line, 1205, Paula Gerbase racked up years of industry cred on London's famous Savile Row. She trained in couture tailoring and worked as the Head Designer for Kilour, a 129-year-old company specializing in bespoke suits. Her commitment to quality craftsmanship and luxury fabrics means that these blazers, trousers and shirts are the kind of clothes you pass along to your children. Swiss cotton, Harris Tweed and mother of pearl buttons make the collection timeless, but Gerbase's modern tailoring make it remarkable. The colours may be muted, but these clothes are definitely not stuffy. Gerbase has thoughtfully taken elements of her menswear expertise and transformed them into feminine silhouettes, the result being a duo menswear and womenswear collection with many unisex possibilities. That means you could go halfsies with your boyfriend on something and draw up a custody agreement (we suggest you take weekends and holidays). Below are our favourite women's wear looks but make sure you check out 1205's website for the rest of the autumn/winter 2011 collection.